Who Is Adele French ? What are the three words that will guarantee social media success? Surely, you will agree with me when I say that social media is a mini revolution in the way people use the Internet. Actually, I feel more accurate in saying a “mega evolution”. In this field marketers can’t assume that users will engage with their brands thanks to high awareness or because they are launching a promotion. Power to the users is more relevant than ever before and this is what makes social media such a complex discipline to master. Once you’re in, your audience will get in the game (you might not be sure how but they will!). You must lead this game by pushing users to create positive feedback through engagement/ endorsement/ advocacy and eventually purchase intent. OK pretty obvious, but how? Of course, training, strategic thinking, pro activity and reactivity are all actions that you will need but what is the magic factor that will make it happen? Look no further, one way or another all those campaigns are based on one or more of these three magic words! The marketers at the origin of those activations brought to life a strong element of utility and/or value and/or entertainment. On top of that, they have leveraged the fundamentals of social media by letting people own their campaigns. Firstly, they perfectly analyzed and understood their audience’s social media usage. Accurate insight is the very basic requirement for building engagement. You must know what users do in order to infiltrate and add, improve or influence their behaviors. They were also ahead of the curve and came up with unique and ground breaking ideas. This is a must in social media: average doesn’t take off. Finally, because they believed in the power of their strategies, they went ahead without compromising and focused their efforts and resources in developing best in class executions. Unfortunately, diminishing initial creative ideas is a mistake that still happens too often due to the difficulties in evaluating return on investment in social media. Over the last couple of years a handful of campaigns stood out for me. I have briefly summarized some of them below. As you will see the results and awards speak for themselves. – The insight: the majority of your social network connections do not belong to your close circle of friends and family. Only 9% of your Facebook connections are friends you would call to go out for a beer. This percentage goes down to 3% on Linkedin and 0.3% on Twitter*. – The business problem: sell more burgers! – The campaign: trade each of your unwanted Facebook friends for $0.37 worth of fast food. – The results**: even though Facebook considered the Burger King application to breach the privacy regulations (“de-friending” notification messages) and eventually pushed Burger King to discontinue the campaign, it was a major success. 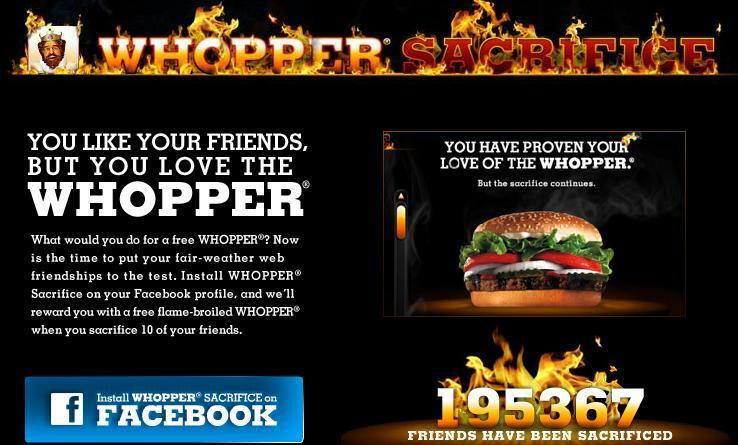 In about 2 weeks nearly 234,000 Facebookers were “de-friended” for the sake of a hamburger and Burger King capped Whooper coupons to 25,000. – The insight: customers want to access help service the way that suits them best. – The business problem: how to deliver “dream support”? Ultimately the goal was to increase business and customer loyalty. – The campaign: use the strength of the Best Buys sales specialists and customer service representatives and enlist a legion of them to respond to questions and concerns about Best Buys products and services that arise in the Twitter stream. – The results***: after three months of activity (supported by a TV launch) the Twelpforce had grown from 400 to 2,200 Best Buys employees. They had responded to over 13,000 public questions, concerns, and opinions. The Twitter feed @twelpforce now counts over 29,000 followers and the number of questions averages 100-125 per day. This campaign won the 2010 Bronze Cyber Lion award in Cannes. The great thing about this campaign is that Best Buys did encourage their employees to actively take part in the program. They provided training and guidelines and gave them a voice to express their passion and knowledge. Spontaneity, involvement was all it took to get this project to fly… What a useful and valuable tool for the customers, and for the employees! – The business problem: break through in the midst of back to school offers and drive more customers to Gap stores nationally. – The campaign: 50% discount exclusively available through Groupon: get $50 worth of Gap apparel and accessories for $25 only. – The results****: the volume of takers was immediate and massive: nearly 300,000 purchases on the first day. This is Groupon’s best seller ever! (about 10 Groupons per second). Gap is clearly heading into social and geo localization and is putting its marketing powerhouse behind it. It was the first retailer to launch a massive 25% discount on Foursqaure earlier in September and then moved on to this partnership with Groupon. One might argue that such discounts are not necessary and have a huge cost to Gap but I think that the buzz and learnings generated by the campaign will be very valuable for the future of the business. – The insight: the photographers community is made of various levels: from total beginners to professionals. – The business problem: how to position Canon DSLR products at the heart of the photographers’ community? – The campaign: photo chain is an online platform where each shot taken by an individual inspires the next. It’s about a community of photographers working together and contributing their photos to keep the chains alive and growing. 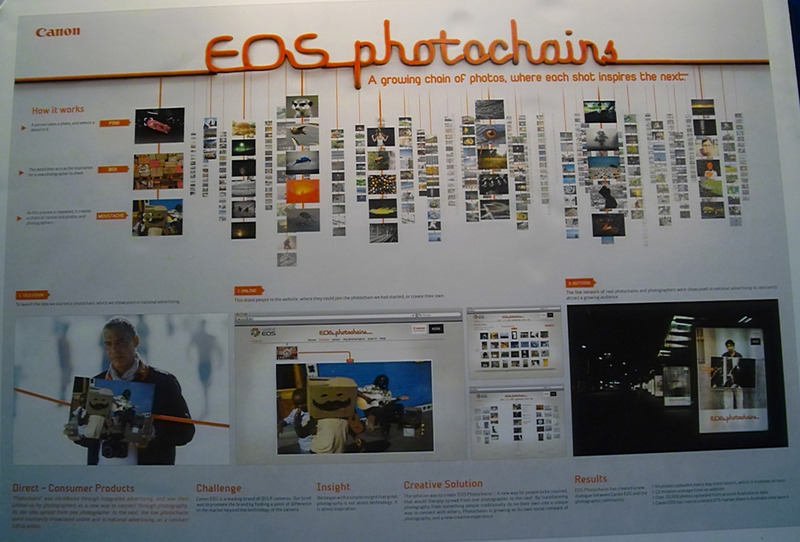 – The results: throughout the campaign 18,709 images were uploaded, while photo chains images have been viewed almost 2 million times and 19,271 people signed up as members of the Canon EOS website. This campaign won the 2010 IAB Australia social media award. This is a beautiful creation from which emerged an active community. It is a fantastic way to produce earned content and build advocacy naturally. Definitely worth checking out, some of the images are stunning!